Health Catalyst today debuted its new Rapid Response Analytics, a new software suite it says can enable a 10-fold increase in productivity for health system analytics teams with results coming in 90 percent faster. The vendor will be discussing this new product along with various health IT trends, including digital health and practical uses of AI, at HIMSS19 next month in Orlando. "The application suite consists of two primary elements: curated, modular data kits called DOS Marts; and Population Builder, a powerful self-service tool that lets any type of user, from physician executive to frontline nurse, explore their data and quickly build populations of patients without relying on IT staff and with no need for sophisticated and customized SQL and data science coding," Dale Sanders, president of technology at Health Catalyst, explained. DOS Marts enable organizations to increase the efficiency of their analytics teams while Population Builder enables data insights and data governance to be pushed to the edges of the organization with an ideal user experience, said Sanders. "I use the metaphor of meal delivery kits to describe the application suite's impact," he said. "We pre-packaged data so data analysts and scientists don't have to go shopping and build the data sets they need from scratch. We give them what amounts to data kits that they can tailor and quickly turn into a 'gourmet meal.'" With other products, data analysts and scientists are forced to operate in one of two modes, he added. "They either have to conduct their analysis under the constraints of highly structured, monolithic data models, like star schemas – frozen dinners – or they have to laboriously piece together the data that they need, build a data schema to store it, then build and maintain the data extraction and loads," he said. "In essence, they spend their time shopping at the grocery store and cooking from scratch. The former restricts their analytic skills and the latter consumes their time and skills on data movement and modeling, not analysis." Results are coming in from early users. Like most every healthcare IT department, Health Share of Oregon's team has historically faced significant delays in responding to requests for data analysis, simply because the process has always required a data analyst, said John Sanders, CIO at Health Share of Oregon, the state's largest Medicaid coordinated care organization, serving more than 210,000 Oregon Health Plan members. "Rapid Response Analytics is quickly making us – and our clinical partners – significantly more productive by enabling us to get data slicing and access out of the hands of the IT department and into those of less technical people who can now use applications to answer their questions themselves, without our help," he explained. "It's a breakthrough that promises to make healthcare data far more accessible and useful to more people." 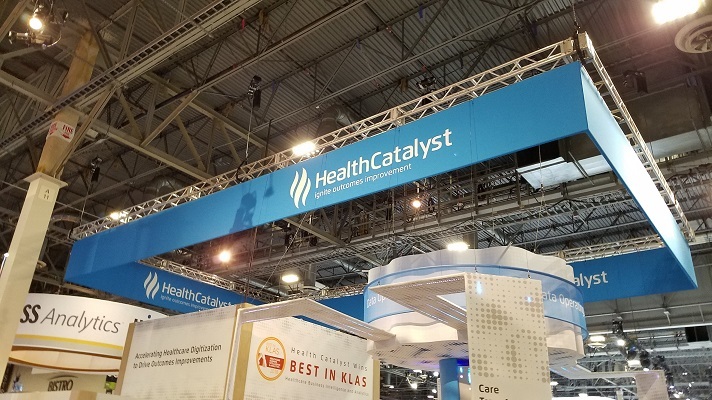 Health Catalyst's Sanders said that two health IT trends HIMSS19 attendees should watch for are digital health and the practical uses of artificial intelligence. "With digital health, I mean digitizing the patient, including life outside the healthcare delivery system, as well as every aspect of their traditional clinical encounter," Sanders said. "We think we have lots of data on patients in healthcare, but in reality, we only collect data on patients an average of three times per year, and we almost never collect data on healthy patients." Clinical notes are largely used to facilitate care transitions and billing; they are a valuable but subjective description of the patient's status, he added. "With digital health, I mean digitizing the patient, including life outside the healthcare delivery system, as well as every aspect of their traditional clinical encounter." And another trend is the practical uses of AI, machine learning and natural language processing to improve financial, clinical and operational outcomes. "There's a boatload of buzz around AI, machine learning and NLP, and with good reason – but all of these technologies that are evolving mostly from data-rich Silicon Valley are no better than the data that feeds them," Sanders stated. "With the exception of image analysis, healthcare is not as data-rich as Silicon Valley. Applying AI to advertising and inanimate objects is one thing; applying it to patients and healthcare is dramatically different." AI has broad uses within healthcare that reach beyond the clinical; it can also assist providers with administrative and financial outcomes. "One great example of this is at our cornerstone client, MultiCare Health System in Tacoma, Washington, where we used machine learning to improve outpatient coding as a way to better understand total cost of care and further benefit from value-based payments," Sanders said. "MultiCare used machine learning to develop an application that provides cost of care information to providers, enabling the providers to identify opportunities to drive consistency in care and cost management."